As a broker we have chosen to specialise in low cost liability insurance, whether you just need public liability or a fully comprehensive policy include employers liability. We have specialist knowledge in the business insurance industry meaning we know exactly which insurer will be best to place you on cover with to ensure you pay a low cost premium and recieve cover which meets your needs. We check a panel of insurers with your quote details to make sure we bring back a competitive price and that the cover is suitable. Public liability insurance also known as business liability insurance by some provides cover for any third party injury or property damage caused by the insured during the course of their insured occupation. An example of an injury to a member of the public which you may be held liable for would be if you were to leave your tools on the ground and someone then tripped over them. Whilst you may think this is unlikely, many people have commented on the increase in liability claims since the growth of 'no win no fee' legal services. An example of property damage would be if you were to carry some of your equipment into the customers property and accidently knock over an expensive vase, obviously this type of incident can occur very easily showing a clear need for liability insurance. 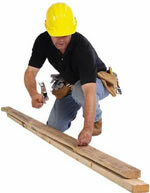 If you are an employer in the UK then you must legally have employers liability. This policy provides cover for any injury your employee may recieve whilst working under your direction, for example if they were working on a ladder which collapsed and they fell injuring themselves. Such claims can obviously be for thousands of pounds which when compared with the low cost of an insurance policy it simply wouldn't make sense not to have liability insurance even if it wasn't compulsory.As an employer you may be confused whether or not the people that you work with are legally considered employees, as a general rule of thumb someone would be considered your employee if they worked under your direction using tools, equipement and products supplied by yourself. Within the UK there is no legal requirement for public liability insurance, however a liability claim against your small business could bankrupt you without having sufficient insurance in place so you should consider it within your business plan regardless of its legal requirement. If you have any employees, even if it was just a part time employee then you must have a minimum employers liability insurance policy of a indemnity £5,000,000 in effect although most insurers offer £10,000,000 as standard. Failure to have employers liability when legally required could lead to fines and even a custodial sentence. If you are self employed or a sole trader then the chances are there is no legal split between yourself and your occupation, meaning that if something were to happen then your own finances would more than likely be required to pay costs which could ultimately bankrupt you which can cause huge problems in your future. Considering we can insure multiple different job types such as nail technician, window cleaner and builder it simply does not make sense to stay uninsured. What will I need to get an online public liability insurance quote today? We realise that as a tradesman you probably don't have time to spend searching online for the lowest priced quotation which is why we provide an instant online quote from a panel of business insurance companies. To get a public liability insurance quote you can simply click on the 'get quote' button which is featured at the top right of this page and then complete a few general questions with regards to your trade/occupation and be supplied with a range of quotations, some more cheap than others and varying cover. There are many different insurers available to provide quotations for this type of insurance such as AXA, groupama, fortis and MMA although we only quote a select few online to make sure we provide a competitive service. The occupations we can cover is extremely extensive for both professional workers and tradesman, ranging from liability for a hairdresser to a roofer.